We really make a right decision on getting this product and are completely satisfied with it. This is my first stroller for my first child and I love all the features. Easy to assemble and the car seat base makes this stroller and car seat a "snap" to put into a vehicle. Way to go Graco another great item! When my daughter was 8 months old, she and I were hit in a head on collision going 55mph. It was pretty brutal, we had to get cut out of the car, rushed to the ER, and I in turn had to have several surgeries in order to recover. My daughter, however, was untouched. I firmly believe that she was saved by God and by this Graco Car seat. As a mom who has been through a horrible accident WITH my child in the car, I would only recommend Graco to any expecting parent. Amazing product I definitely recommend, the shipping was very fast and the material is really good. Also is very cute I loved the color. I have been using this stroller for a few months. I put it on my registry because it had good reviews and it seemed like a fair price so I definitely expected more. I now regret making this choice. -The canopy will not stay up! Overall, it's just been more problems than it's worth and I'm looking into another travel system. I have a lot of other Graco products that I like but unfortunately, this travel system is not one of them. Purchased for my niece as it was on her baby registry along with a couple of other brands and it had the best safety ratings and it was also her color scheme for her new son. I got this as a gift at my baby shower, and I'm very disappointed in it. I have always used and loved Graco products but this one just isn't mommy friendly. The infant carrier is INCREDIBLY difficult to get off of the base and the head "support" in it did not support AT ALL. The stroller is difficult to open with just one hand. I was so excited to get this, just disappointed. Great for Me and My Baby!!! I brought this a month ago and so far so good. It's not heavy to me , it works great for me and my baby. I bought it for my first baby. And I love it also the price is good too! THE stroller folds so that the seat is on the outside. This makes it very hard to keep clean and not get ruined. The parent bar does not fit phone and the basket is too small and hard to get things in and out of. I love graco products but this is not one of my favorites. Wish I would have bought a different travel system. My parents bought me this stroller as a gift. I really liked it because it looked really nice and comfortable but now that I got to use it for my daughter I see that it is a horrible product Graco has made. My biggest problem is getting the car seat out it is super difficult to get it to unlatch from the base, sometimes I even wake up my daughter when she's sleeping because I'm taking her out of the car and I have to pull on it so it can unlatch, my second problem is that their is not enough support for my daughters neck or head she's always tilted to one side and my third issue is the canopy on the stroller will not even stay up. Honestly I would not recommend this travel system to any one so please just look else where because it's a waist of money!! I am looking to buying her a new travel system where she can be more comfortable and I won't have to struggle as much. Was involved in a car accident that flipped the car over on it's roof, this car seat held my 4 week old baby in place. This seat helped save her life. I replaced the car seat with this exact same seat. We were given this travel system as a baby shower gift and I was skeptical, I'm rather picky about car seats. I was surprised at the ease of use for this travel system! The seat easy snaps into the base and its simple to remove as well, hold the button on the back and lift. The stroller opens easily and the seat snaps right on and it's easy to push, with plenty of room underneath for a larger diaperbag. The only downfall is that I think it provided enough head support and it's not safe to use 3rd party supports. This is my 5th stroller- all Graco. My Duo Glider was easier to open. This stroller takes 2 hands to open every time. It is by far my least favorite of all. The mechanism to lay down/push-up the back takes 2 hands too and is not a smooth transition. I gave my old stroller to a single mother in need. I wish I could buy it back from her. This stroller is for my 7th child, so I have experience in child rearing and was always satisfied with Graco...not now! The carseat is difficult to detach from the base. My 15 year old can barely do it. I will be transitioning to next carseat style asap and shopping for a different brand of stroller or older Graco version at garage sales. Very disappointed in Graco. We bought this travel system on Black Friday before baby arrived and now my baby is almost 4 months old. The stroller is super heavy and the car base is hard to put into the car. The wheels lock up and it's just basically like pushing around a big bus. I wanted to love it I really did but everything is so bulky compared to all the new chic strollers these days. I guess you get what you pay for. My cousin bought this for me as a thanksgiving gift. I just opened and assembled and found that the wheel pin for rear is missing in the package. Not sure what to do with it. I love the ease of using the product. The FastAction Fold system is just that, fast and easy for the stroller, and the car seat easily clicks into place. This was purchased for me and I love that it came in my favorite color, the stroller was very easy to assemble and the car seat is easy to operate and came with a newborn insert. I love that it came as a system and is easy to use. 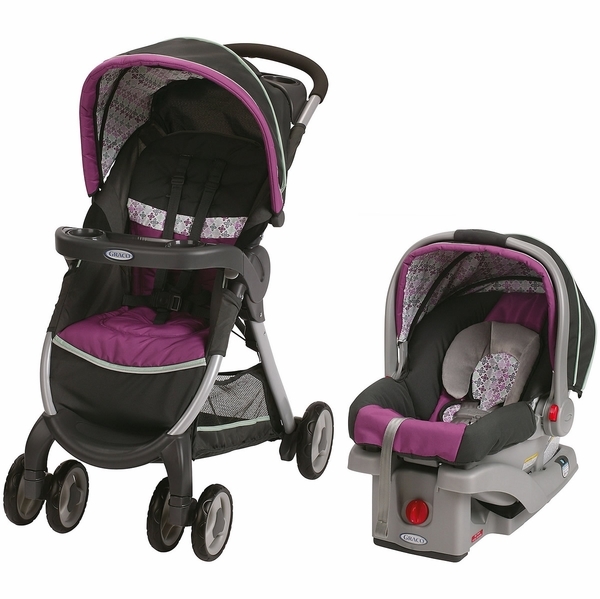 Its a great stroller in terms of comfort but recently my stroller has been giving problems in moving. It really needs a lot of push to take turns and move ahead. The wheels do not work properly. Love the colors and features!! My husband bought this travel system for our baby due in June of 2017 and I absolutely love the color! My husband loved the fact that the travel system came with a base and he was super excited about perchesing a travel system that was 1) a great price 2) great color selections(we went with the purple set) and 3) easy to put together and install the base! 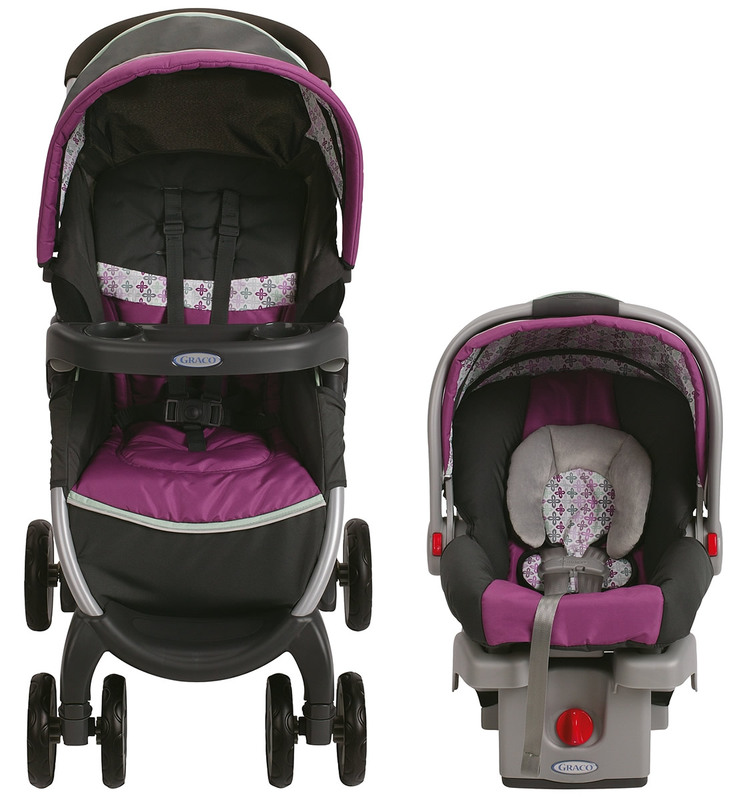 We will be recommending the graco travel system to our friends who are expecting!! It was confusing at first but once I really figured it out the car seat is awesome! The carriage is light and easy to use! But this travel system for my first baby and I love it! The stroller is super easy to maneuver and folds up for traveling. The carseat is so easy to get in and out of the car because of the click base. 1st time mommy, super easy to set up. I left the kitchen for a couple minutes and my husband already had everything set up, he wanted to surprise me and he sure did. I like the simple design and huge space underneath. Looks super safe for my little princess, it was really easy to register for recall product online at Graco. We got a really good price for the 2. Overall satisfied with this buy, I love Graco and the quality at a good price. I trust Graco with my babygirl. Bought because I found a great deal ! Love how light it is being a mother of two now ! The stroller and car seat are so easy to use! I would recommend this to anyone! I just got this travel system excited to use for the next day but while putting it together noticed the axle rod doesn't fit in the axle hole and they don't line up! I'm very upset and frustrated I needed this stroller for tomorrow. My daughter loved his and it's so easy ! I love the cushion on the handle . I really loved this set and passed it down with matching play pin to my sister in law. I really loved this set ! So easy to snap in my babies and load my car . I love love loved it ! A gift from my niece. Though we haven't use yet since I will be due last day of January I am sure this will work well. Easy and fast to install. My husband loves it. The color is pretty for our baby girl too. Before purchasing this travel set my husband and I did a ton of research and went to various stores to "test" out the many strollers & car seats. We wanted something easy to fold and also light-weight didn't want to comprimise quality. We read a ton of reviews before we made our final decision to purchase the FastAction Fold Click Connect Travel System and once we received the product we were totally satisfied. We can't wait to bring our baby home to his first ride! I purchased this January 2016 and where the car seat locks into the stroller the seam has already ripped apart. I have not yet contacted CS about this issue but I will be doing so and I will update my review pending how helpful they are. We can still use the stroller but I'm afraid as my baby grows it will rip more. Over all we are happy with the product but disappointed that it's already coming apart after just 6 months of occasional use. We love how easy it is to fold and to detach and attach the car seat! So happy we bought it early for our baby. Easy to transfer between car and stroller, easy to install base to car, and seemingly comfortable for baby. This is my third child and first time buying a Graco travel system and I am beyond disappointed! The car seat canopy is so hard to move and makes so much noise and always startles my little one when attempting to adjust! Wakes him up every time then on top of all the difficulties adjusting I have a crying baby to try to calm down. It is also so close to the car seat handle which also makes it so difficult to adjust. I dread every time I have to use it. The other issue is with the stroller canopy, it is so loose, you can't extend it only half way, it won't stay it must be fully extended. Once fully extended with the car seat on they both are the same height, which won't allow one to go over the other which creates a problem since it's so loose it always falls down! The basket underneath is also very small, you'll barely be able to fit anything under it. Such a waste of my money and a huge disappointment. Not to mention that straight out the box the car seat handle and stroller tray were all scratched up. The last thing I didn't like was that you can't put the car seat in carts at the store. I would NOT recommend this travel system to ANYONE! Great product! Cost effective, easy to set up and comfortable for our little one. I got this as a gift before my daughter was born and it's the best. The car seat straps are so easy to adjust, and the stroller is great; very easy to maneuver and even easier to open! I would definitely recommend this product to anyone who is considering it. I absolutely love this travel system, as well as all items from Graco. It's a brand that's been trusted for years and backed by their name. This car seat has an infant insert, and is very secure. 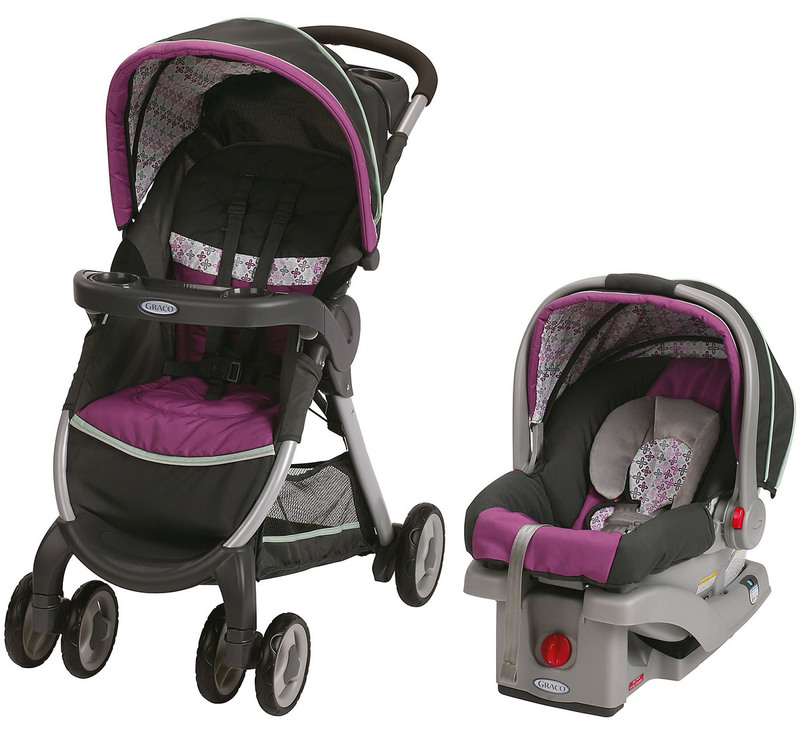 The stroller has a large storage compartment, parent cupholders and simple one-handed fold. Click connect allows you to simply click the car seat into the stroller. Beautiful color. Couldn't be happier with my purchase!!!!!! It's simply a very great product! 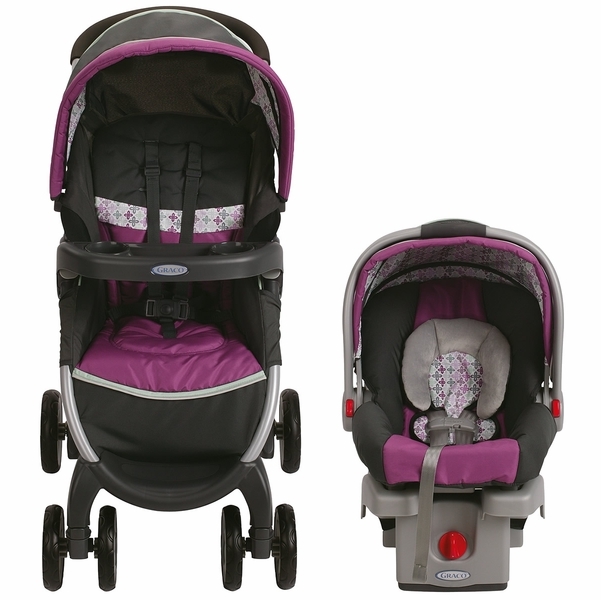 I love the color and the features that this travel system contains. I felt that my baby girl was very safe and secured in this. Great product to buy! I would really recommend it. It's a must have!! Experience the convenience of the one-second fold, with Graco’s FastAction™ Fold Click Connect™ Travel System. This lightweight stroller features a one-second, one-hand fold, so that it’s easy to bring with you at a moment’s notice and your other hand is always free to comfort your child. It includes a pivoting child’s tray with cupholder, an extra-large storage basket, parent’s tray with two deep cupholders and is self-standing when folded. It includes the SnugRide Click Connect 30 infant car seat, one of America’s best-selling infant car seats. The FastAction Fold Click Connect Travel System is perfect for your adventures with baby.